On August 25th, 2005 the very first Service Ribbons were awarded at Tactical Gamer. Since then, there have been hundreds of registered Tactical Gamer members, playing in dozens of different game titles, who have been nominated by their peers as worthy and deserving of recognition. Awarded ribbons are displayed in the signature area of your forum profile and should be worn with pride. Because you can only be nominated by other Tactical Gamer members and the nomination has to be affirmed by Game Admins, being awarded a service ribbon isn't an easy accomplishment. What are Tactical Gamer Ribbons? I want to initially point you to two locations that are found in our forum list. 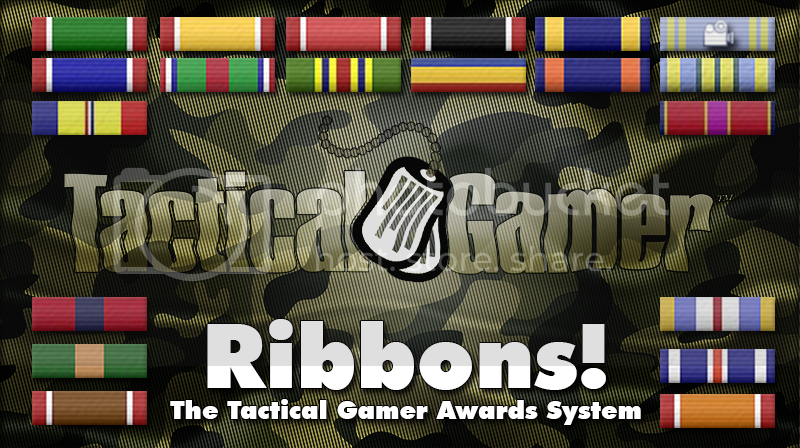 First the Tactical Gamer Awards Presentation parent forum, where you can find every awarded ribbon in the history of the Ribbons System. Located in each specific award thread is the Description of the ribbon award contained within. The second location you need to be aware of is The Awards System at TG thread that explains the purpose and process of the Ribbons System. The process from nomination to award isn't difficult, but it does take some planning and effort on your part, the part of the nominator. In order to make things as easy as they can be, we've created a guide aptly titled Ribbons for Dummies: A Guide to the TG Awards System. In this thread you'll find an overview of the system, a list of currently supported ribbons, instructions on how to make a nomination, and a newly created Frequently Asked Questions section. If you still have questions, or just want clarification you can always send a PM to our local ribbons expert, Ribbons himself. The First Step is You! Ever feel like someone went above and beyond to volunteer their time, knowledge and expertise? Ever think that someone you just shared a round with really performed above the expectations of a TG tagged player while fulfilling the role of Squad Leader, Medic, Pilot, Wrench Monkey, Tank Driver, or any other mission critical role? Take the time to nominate that person for a Service Award. Take 15-30 minutes out of your day to recognize someone for helping make your gaming session memorable and special. You are the key in helping your peers get the recognition they deserve; You, the nominator. Mordana, the Ribbons requirements have been revamped a bit. My apologies! But still good info to point out here. It's good to see Ribbons back! I wrote a few nominations myself. I know most of us don't play for the recognition but getting positive feedback and the fact that other see what effort you put into your gameplay and teamwork is a huge boost!